Start off your visit on the 5th (Thu): kick back and relax at Ao Nang Beach, get great views at Railay Beach Viewpoint, and then trek along Railay Beach. For more things to do, ratings, photos, and tourist information, refer to the Krabi Town trip planner. Singapore, Singapore to Krabi Town is an approximately 3-hour combination of subway, flight, and taxi. You can also drive; or do a combination of bus, train, and taxi. Traveling from Singapore to Krabi Town, you'll gain 1 hour due to the time zone difference. 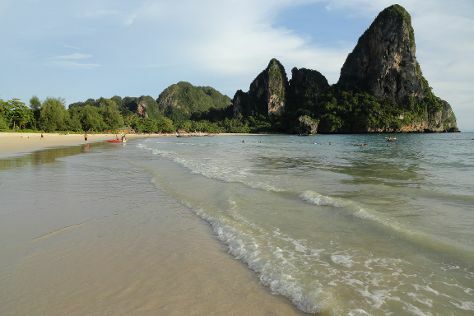 Traveling from Singapore in January, Krabi Town is slightly colder at night with lows of 26°C. Finish up your sightseeing early on the 6th (Fri) so you can catch the flight to Chiang Mai. On the 6th (Fri), surround yourself with nature on a nature and wildlife tour. On the 7th (Sat), you'll have a packed day of sightseeing: relax and rejuvenate at some of the top local wellness centers, admire the striking features of Wat Chiang Man, stop by G.G Armani collection, then admire the striking features of Wat Chedi Luang Worawihan, and finally contemplate in the serene atmosphere at Wat Phra Singh. To find ratings, where to stay, and other tourist information, go to the Chiang Mai travel itinerary planner. You can fly from Krabi Town to Chiang Mai in 2.5 hours. Other options are to drive; or do a combination of ferry and bus. Traveling from Krabi Town in January, expect slightly colder with lows of 18°C in Chiang Mai. Wrap up your sightseeing on the 8th (Sun) to allow time to fly to Bangkok. Start off your visit on the 8th (Sun): step into the grandiose world of The Grand Palace, then take in the spiritual surroundings of Wat Pho, then take in the spiritual surroundings of Temple of the Emerald Buddha (Wat Phra Kaew), and finally admire the landmark architecture of Jim Thompson House. To find reviews, photos, ratings, and other tourist information, refer to the Bangkok itinerary planner. Fly from Chiang Mai to Bangkok in 3 hours. Alternatively, you can drive; or take a bus. Traveling from Chiang Mai in January, expect a bit warmer with lows of 25°C in Bangkok. Wrap up your sightseeing by early afternoon on the 9th (Mon) to allow time for the flight to Patong. On the 10th (Tue), enjoy the sand and surf at Patong Beach, then don't miss a visit to Bangla Road, and then see some colorful creatures with a scuba or snorkeling tour. Keep things going the next day: stroll through Karon Beach, then get great views at Nai Harn Beach, and then enjoy the sand and surf at Kata Beach. For ratings, other places to visit, more things to do, and other tourist information, read our Patong custom trip planner. Getting from Bangkok to Patong by flight takes about 4.5 hours. Other options: drive; or take a bus. Expect a daytime high around 37°C in January, and nighttime lows around 26°C. Finish your sightseeing early on the 11th (Wed) to allow enough time to travel back home.